(Nanowerk News) Tübingen researchers control interplay of light and matter at the level of individual photons emitted by rubidium. Researchers led by Dr. Sebastian Slama of Tübingen University’s Institute of Physics have succeeded in directing the fluorescence of ultracold atoms into surface plasmons – light waves oscillating across a metal surface. Quantum physicists aim to create tiny systems in which things such as the interplay of light and matter may be observed at the level of individual photons. Such controlled systems hold the promise of applications such as transistors and switches depending on a single photon. The results have been published online in Nature Physics ("Cooperative coupling of ultracold atoms and surface plasmons"). The researchers lowered the temperature of rubidium atoms to one millionth Kelvin – to almost absolute zero – and brought them to within a few hundred nanometers (millionths of a millimeter) of a gold surface. The atoms were floating in a vacuum, held in place by magnetic fields only. 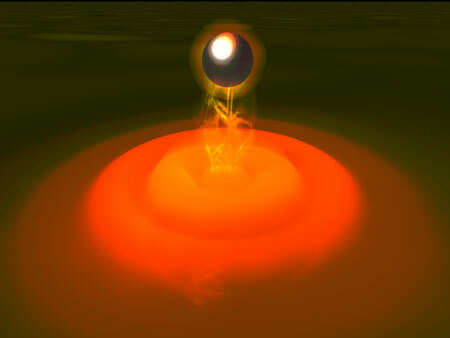 Under such conditions, the atoms prefer to emit their light into the surface plasmons – and the researchers detected those photons. “The process is very efficient, the atoms have a high cooperativity,” says Sebastian Slama. The light-matter coupling turned out to be easier in these experiments than with other methods, such as optic resonators. “The new method can be used in the future to read and process quantum information which has been stored in the atom with little dissipation,” says Slama. He hopes that the construction of interfaces between quantum storage and quantum data conductors may lead to the development of a highly-efficient and completely new type of computer in the future.